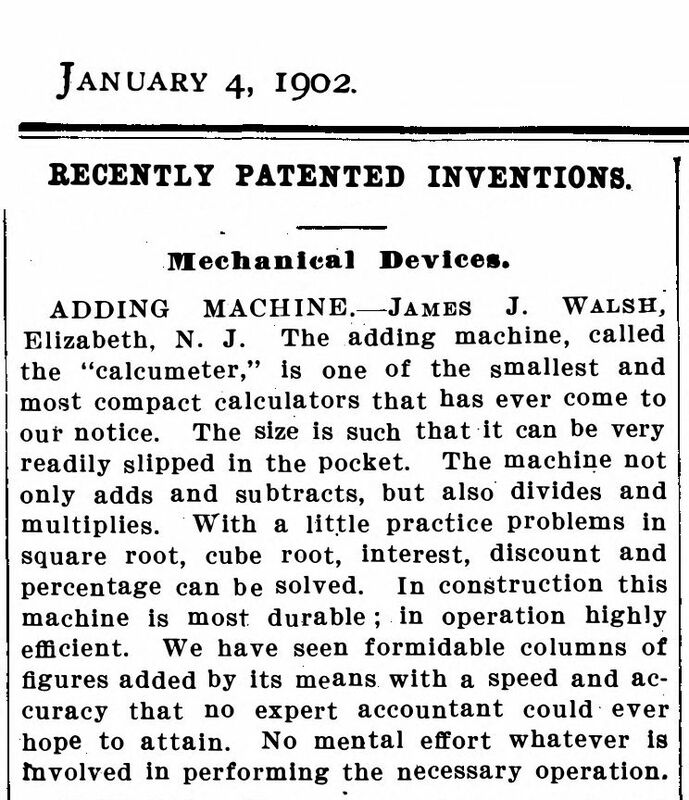 The Calcumeter was designed by James J. Walsh from Elizabeth, New Jersey, and he was granted a patent for it in 1901. 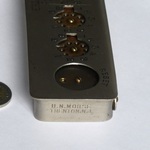 In 1903, Walsh with the help of Herbert North Morse put the adder into production. 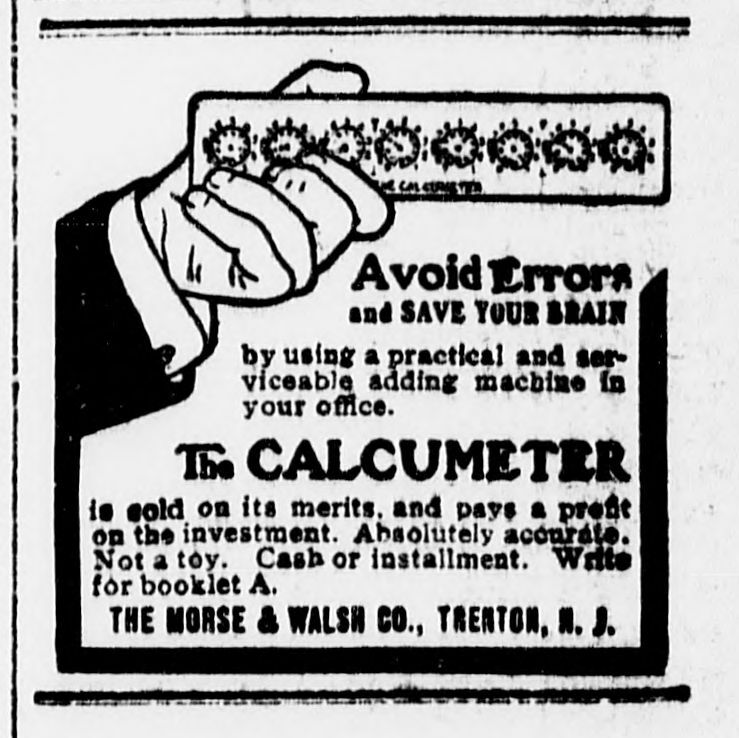 At first the Calcumeters were inscribed with "Morse & Walsh Co.", but from December 1905 it was just "H. N. Morse Co.". 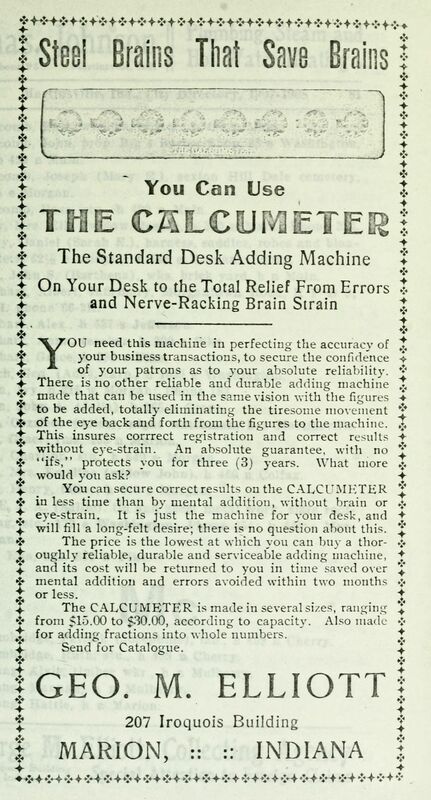 Walsh then invented and patented a clearing mechanism, and when the clearing mechanism was added to the Calcumeter in December 1907 it was renamed the Standard Desk Calcumeter. 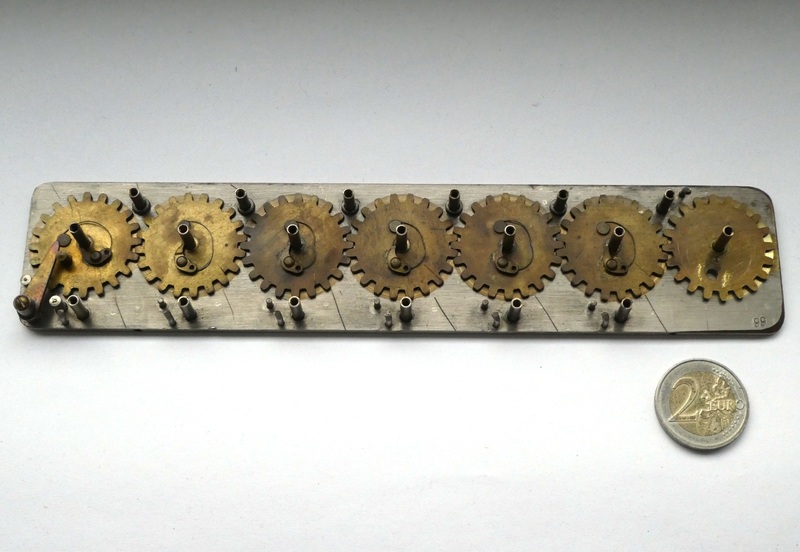 Many variants exist, ranging in size from 5 to 12 number dials, with or without reset wheel, and/or with larger wheels for pounds/shillings/pence/farthings or feet/inches/sixteenths, etc. 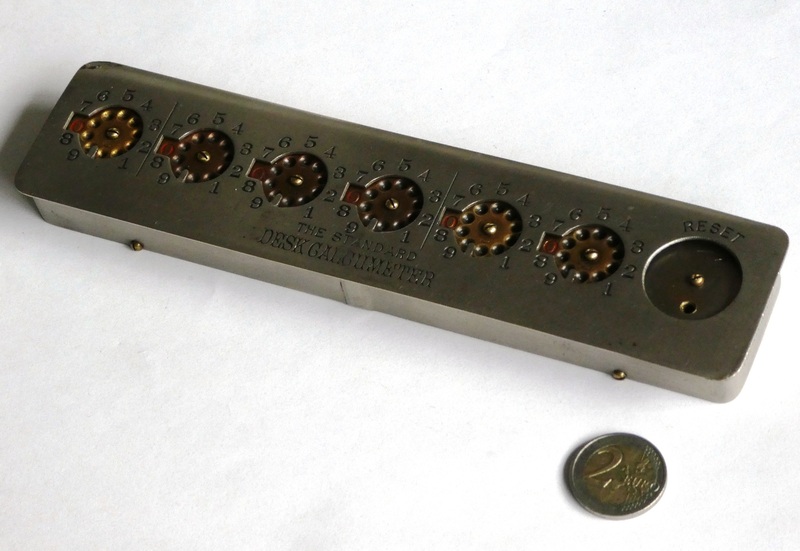 My Calcumeter is shown in the photos, and is one of the later ones to be made. It has 6 dials and has the reset mechanism. 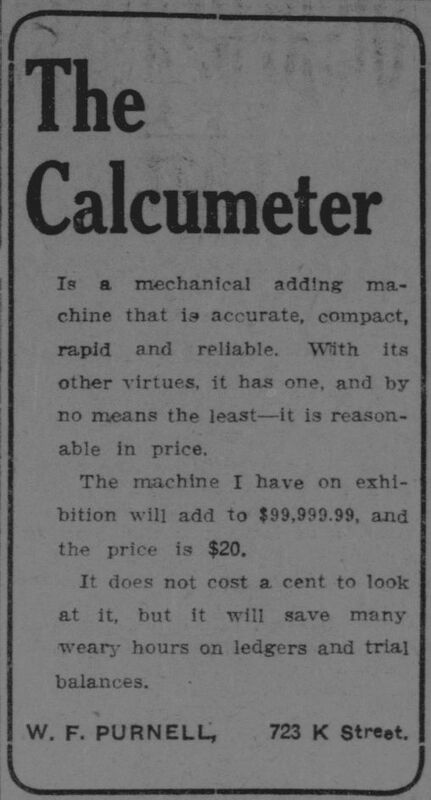 It has serial number (99)89158, which means it is probably from 1912. It does not have the original stylus or box. 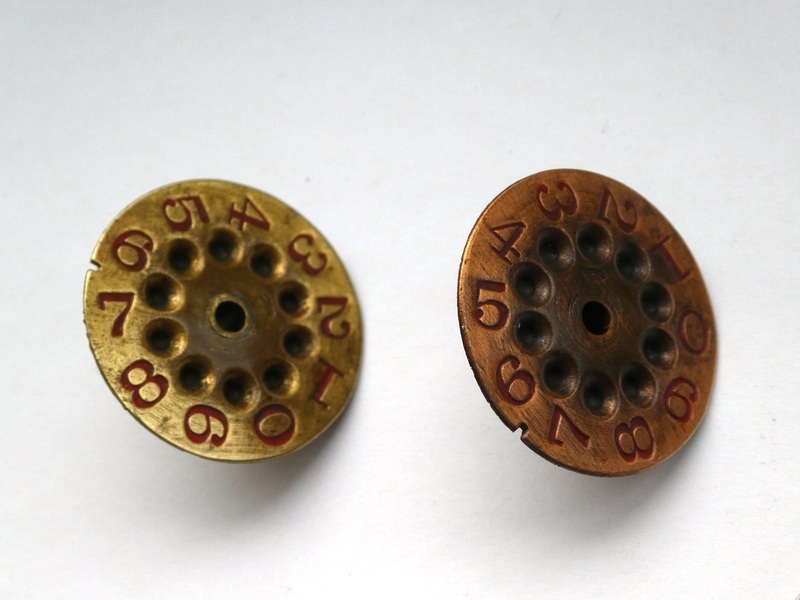 The dials are made of two differently coloured metals, brass and copper, arranged in groups of sizes 1, 3, and 2. It is well-made and quite heavy - almost 600g. It has two foldable legs that allow it to stand at a 45 degree angle for ease of use. There are six number dials which the user can adjust using a stylus. 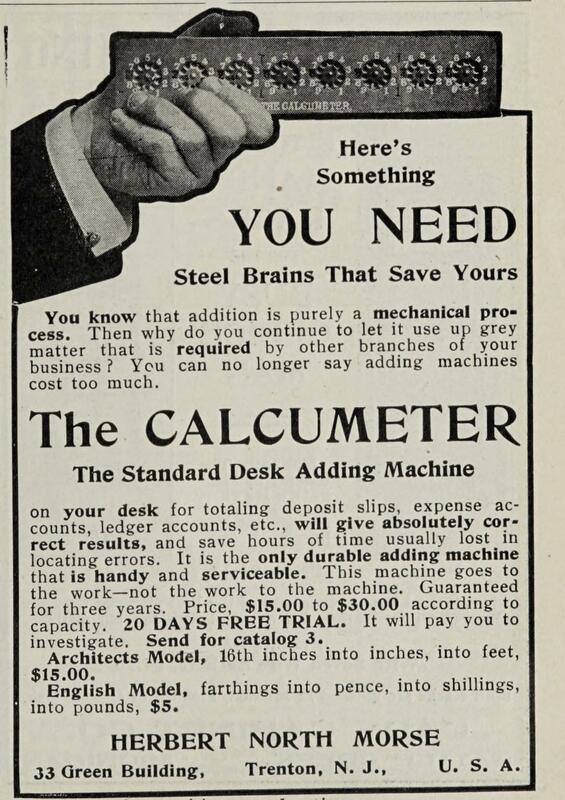 The Calcumeter originally came with a pencil that had a metal stylus on the other end, but few of these stylus pencils remain, and I don't have one. 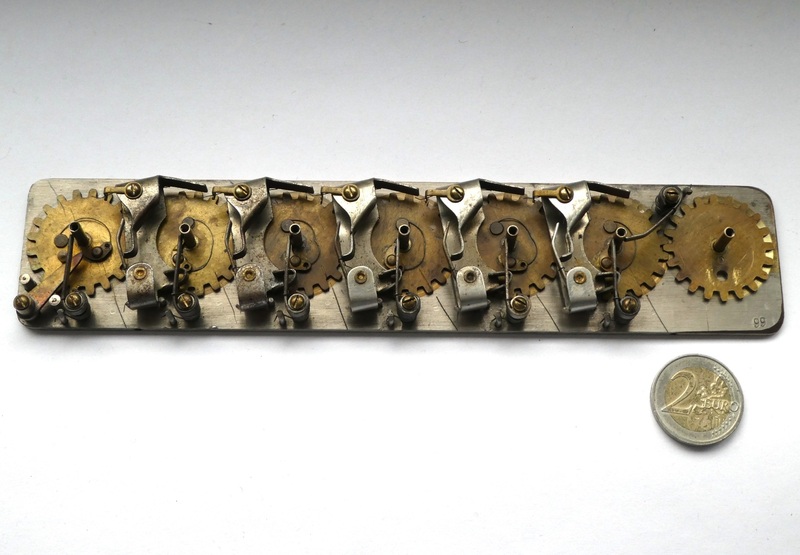 The left of each dial is exposed showing a single digit. 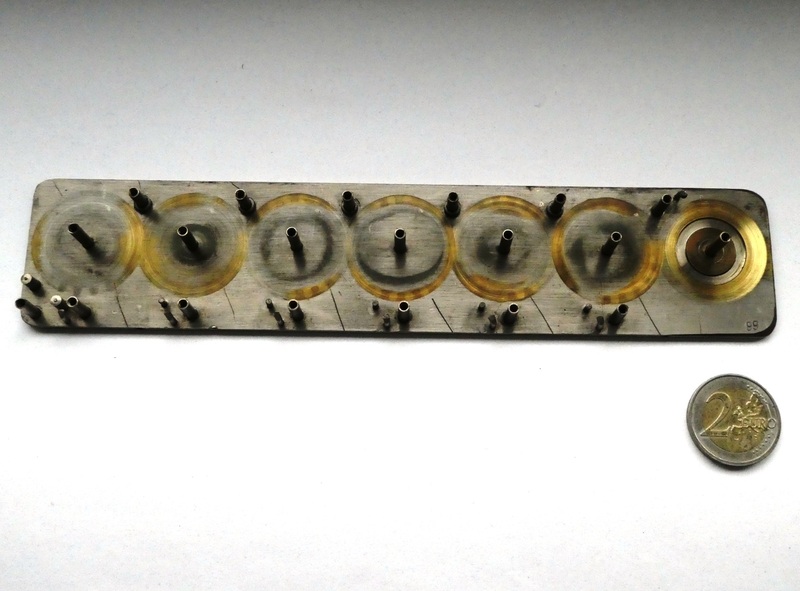 Each dial has 10 holes arranged in a circle for the tip of the stylus. 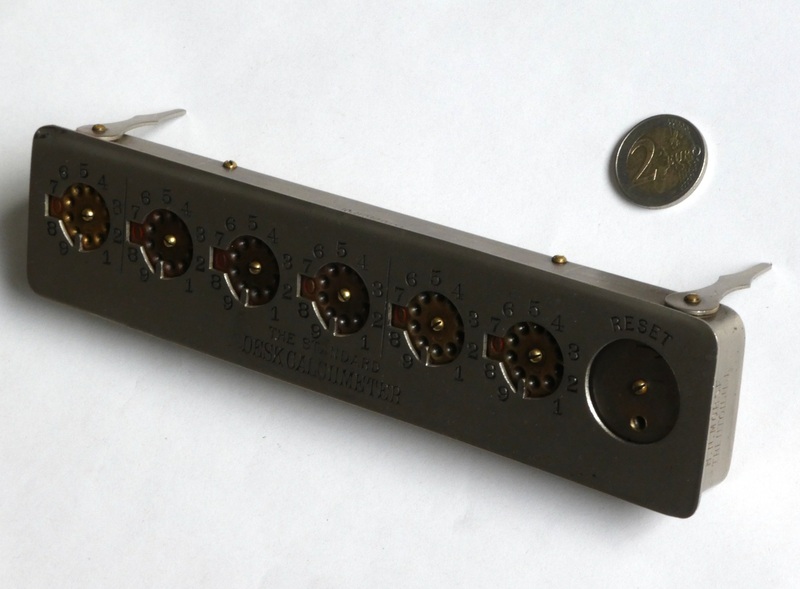 The numbers 1 to 9 are etched into the front plate around the outside of each dial. 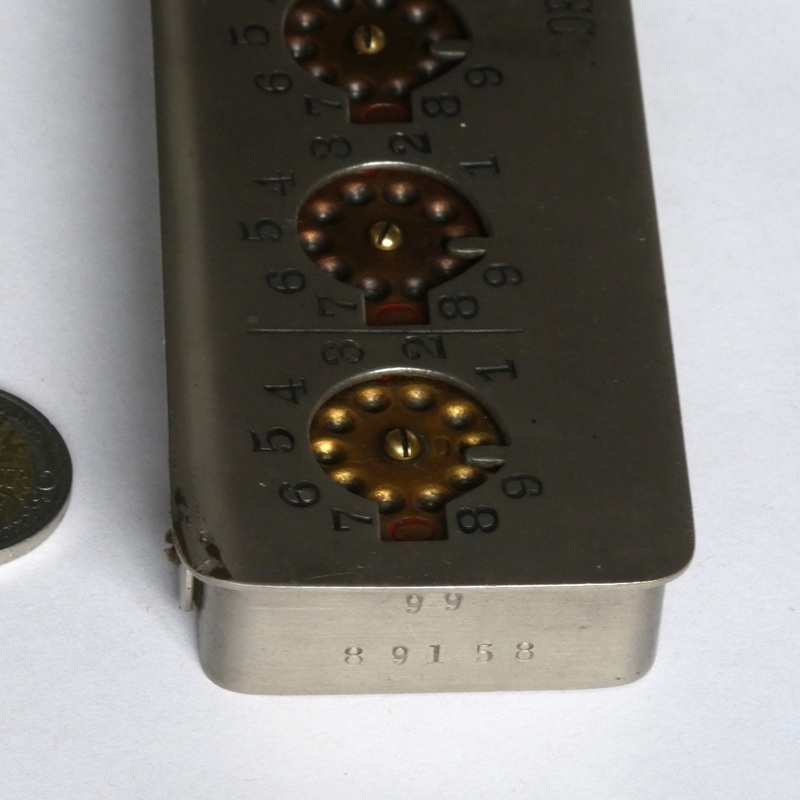 To add a number, enter the digits one at a time simply by putting the stylus in the hole next to the digit you want to add and turning the wheel clockwise until the stylus hits the metal at the bottom. 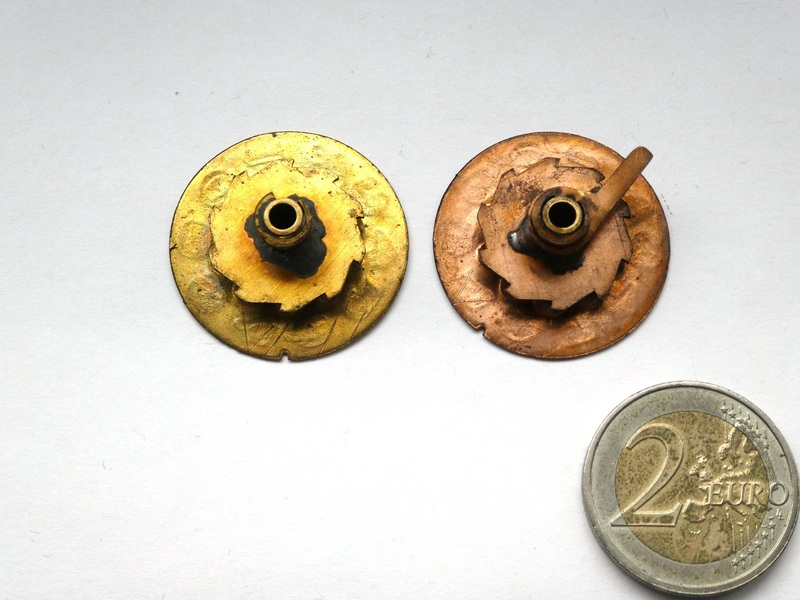 When a wheel is turned from 9 to 0, a carry to the next wheel is performed automatically. 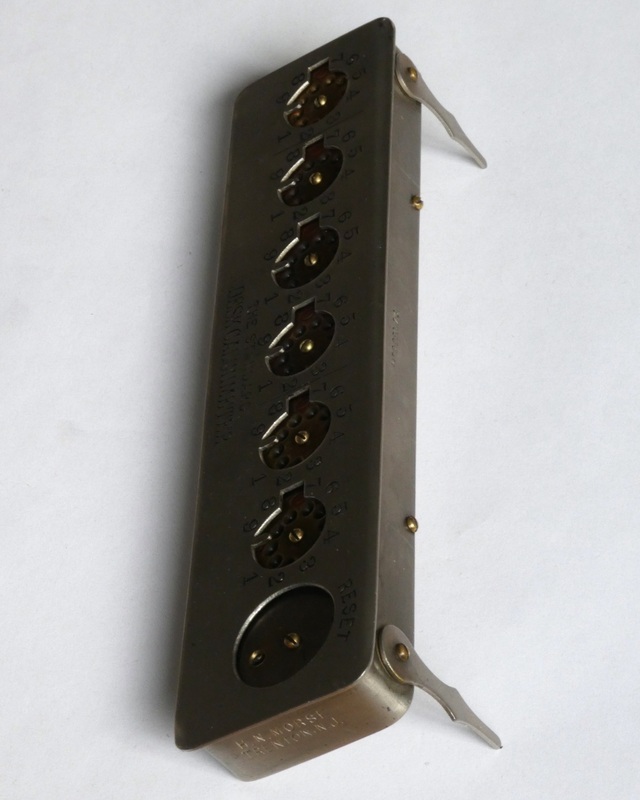 On various sites it is claimed that it uses a stored-energy carry mechanism. This would mean that the energy needed to execute a carry does not come only from the stylus pushing a digit from 9 to 0, but also from some of the previous increases from 0 up to 9. 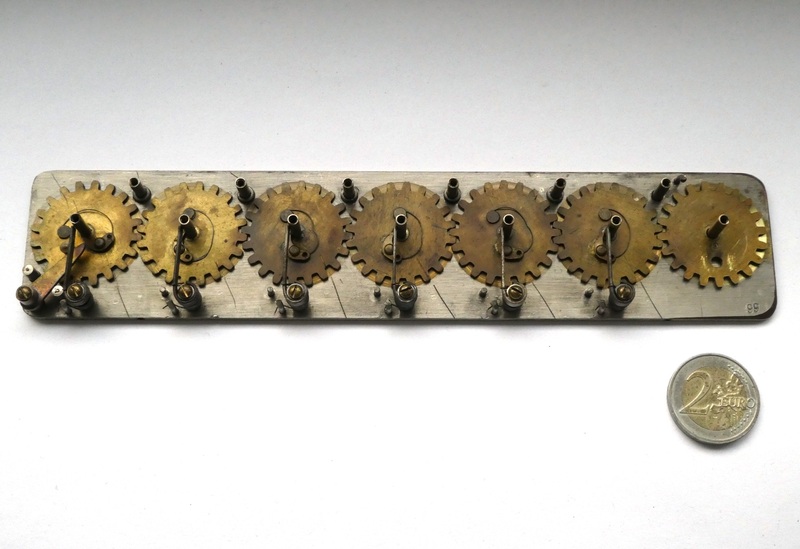 As a digit wheel turns such a mechanism puts energy into a spring, and when a carry occurs that energy is released all at once. The Schnellrechner is an example of a simple adder with such a mechanism. It has the great advantage that however many digits are carrying over simultaneously, it requires the same amount of force from the stylus. 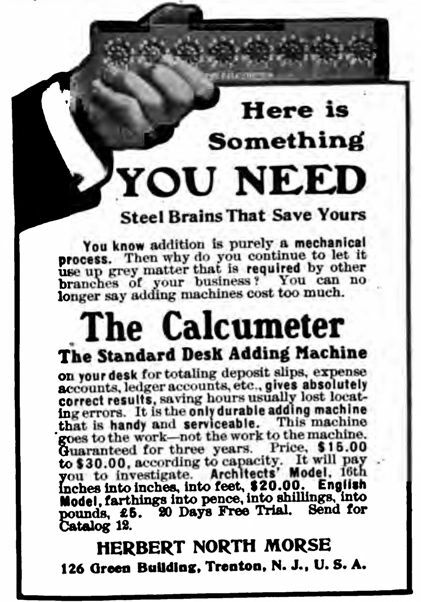 The Calcumeter does not have a stored-energy carry mechanism however. When a carry occurs, the wheel with the stylus has a rod that pushes against a latch that directly rotates the next wheel. 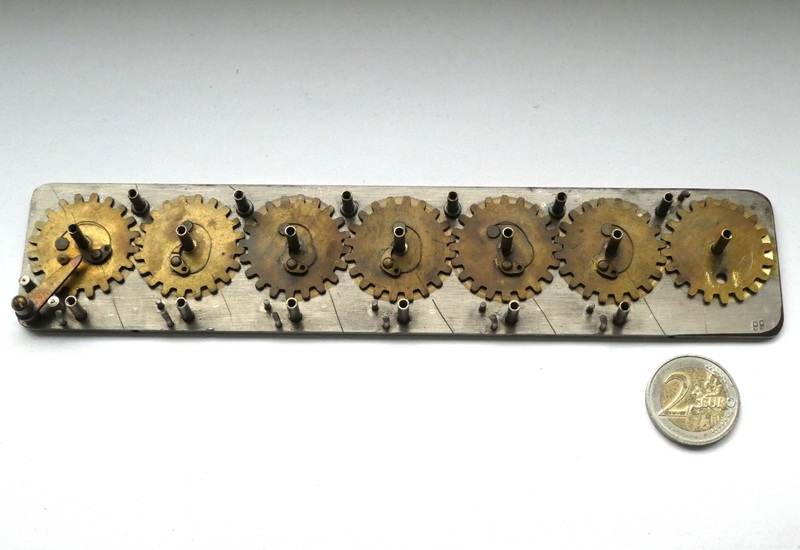 This means it takes a little more force to make the dials roll over from 999999 to 000000, but since the wheels move so easily it is not a problem. I imagine that it could be quite difficult to achieve on a 12 dial version unless it were kept in very well-oiled condition. Unfortunately the carry mechanism forces the dials to only move clockwise. 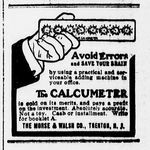 Subtraction must therefore be performed by adding the tens complement. 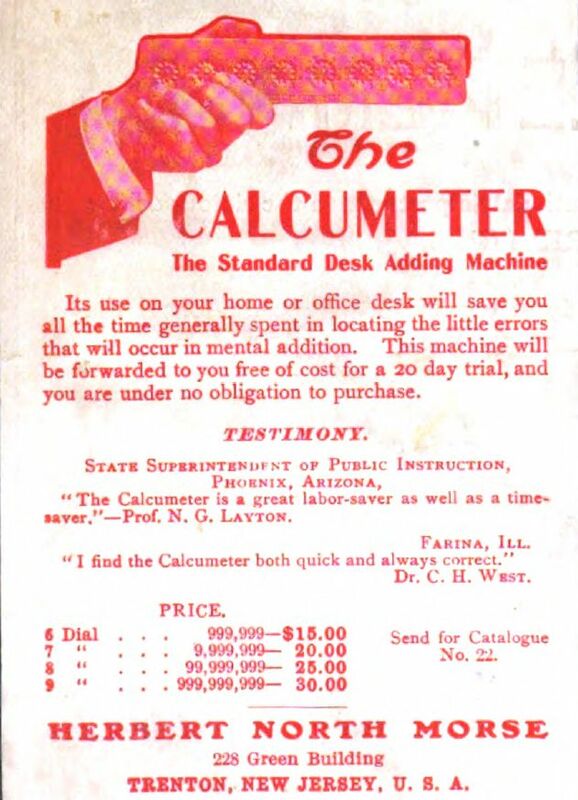 The complementary digits are not shown anywhere (very early versions of the Calcumeter did show them). To enter a complementary digit, put the stylus at the 9 (just to the left side of the stop), and rotate until you reach the digit you need to subtract. 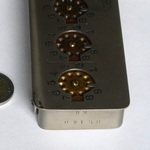 To subtract 53 for example, put the stylus at the 9 of the units dial and rotate it till the stylus is at the number 3, then put the stylus at the 9 of the tens dial and rotate it till you reach the 5. 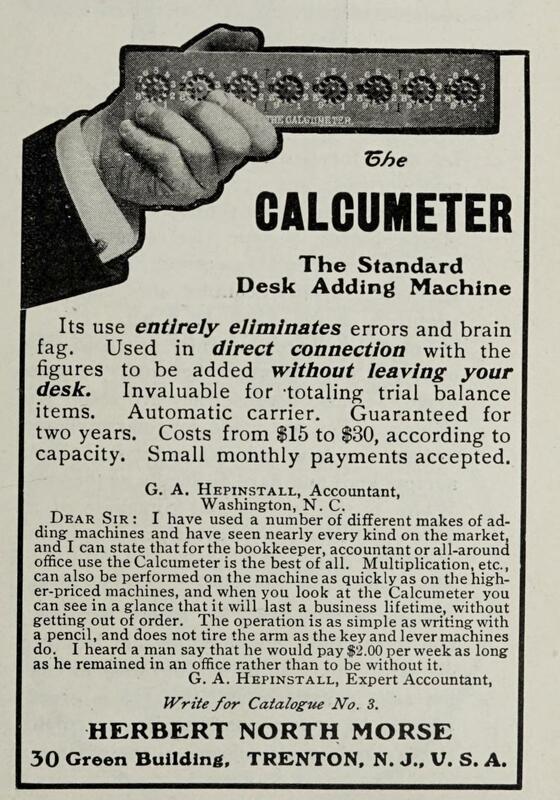 You then have to continue by subtracting 0 from each of the remaining dials (i.e. move the stylus from 9 to 0 on each dial) so that you have added the digit-wise complement of 000053, i.e. 999946. After that, add 1 to the units dial to get the correct answer. The end result is that you have added 999947 = 1000000-53, which on the 6-digit display is equivalent to just subtracting 53. 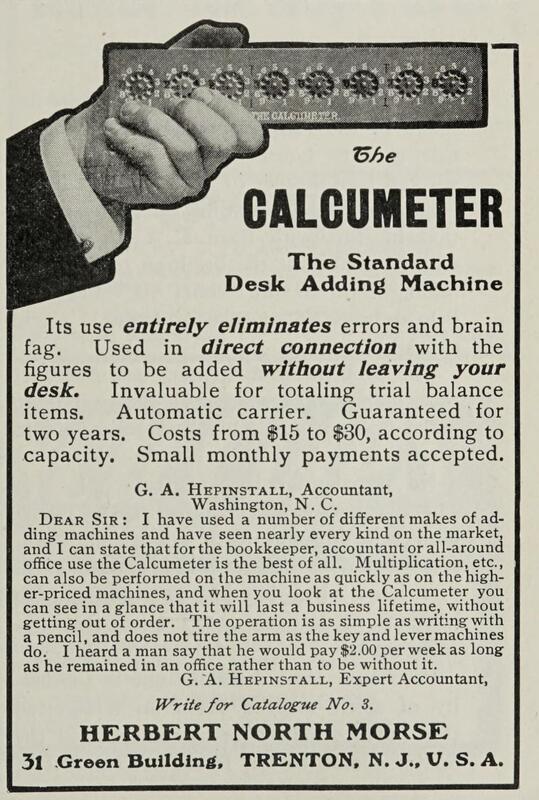 It has a clever clearing mechanism controlled by reset wheel to the right of the number dials. You turn the reset wheel clockwise as far as possible, which turns wheels 2, 4, and 6 clockwise until they show 9. Then turn the reset wheel counter-clockwise as far as possible, which turns wheels 1, 3, and 5 clockwise until they reach 0. When they change from 9 to 0, they cause a carry that sets the other wheels to zero. The follow-on carry from those other wheels has no effect on the still moving wheels, so this leaves all the wheels at zero. 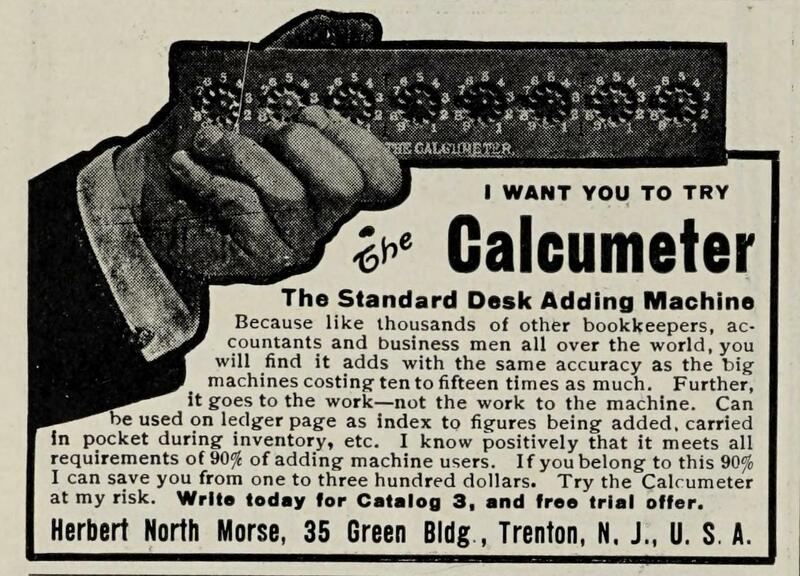 It is unclear exactly when Calcumeter production ended, but it was probably around 1914. 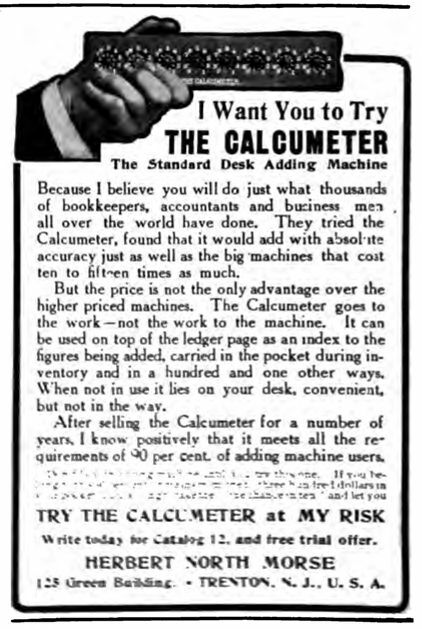 I have not found American advertisments after 1908 in online archives, but apparently there were adverts until 1913, at which time they claimed that 100,000 of them had been sold. Here is a video where I demonstrate the Calcumeter. 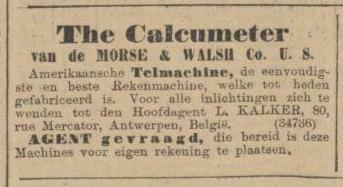 Here are a few advertisements I found in online newspaper and magazine archives. 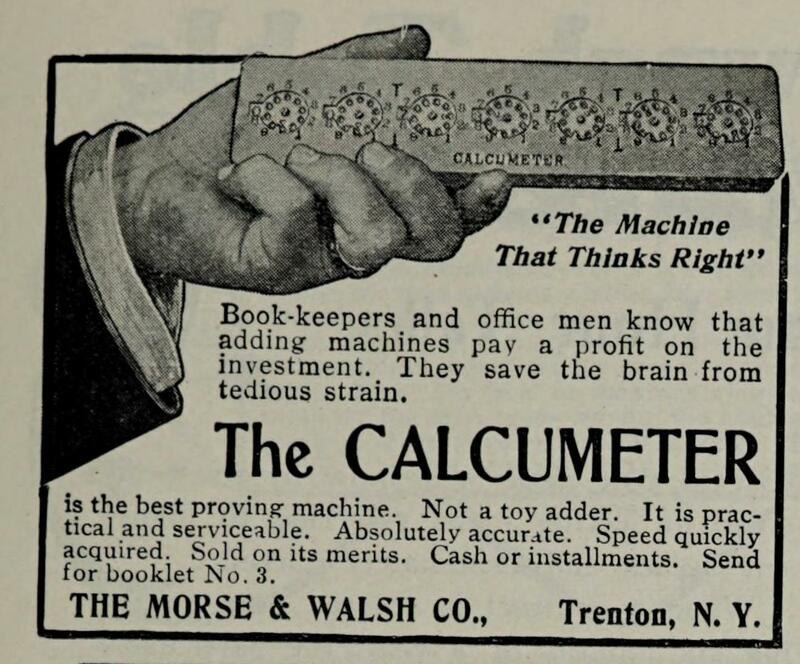 There are not many articles related to the Calcumeter in newspaper and magazine archives. 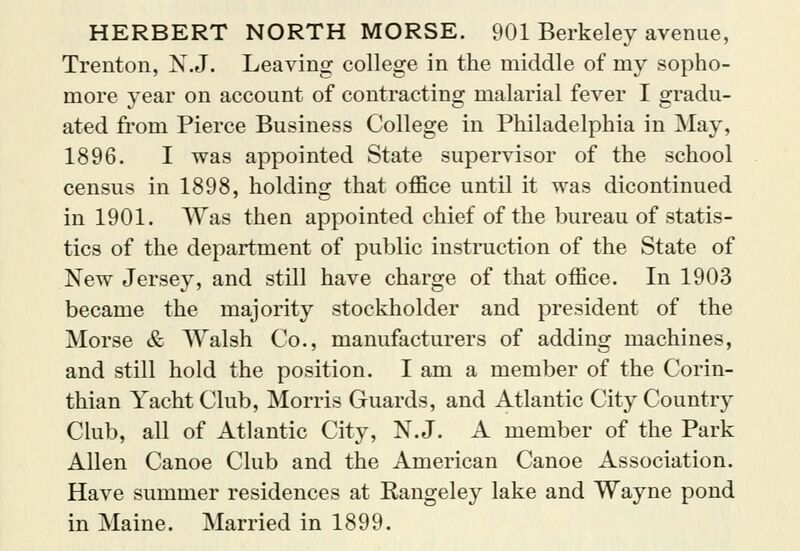 All I found are an initial announcement of the patent in the Scientific American, and two short biographies of Herbert North Morse. I have also included an extract from Ernst Martin's book. 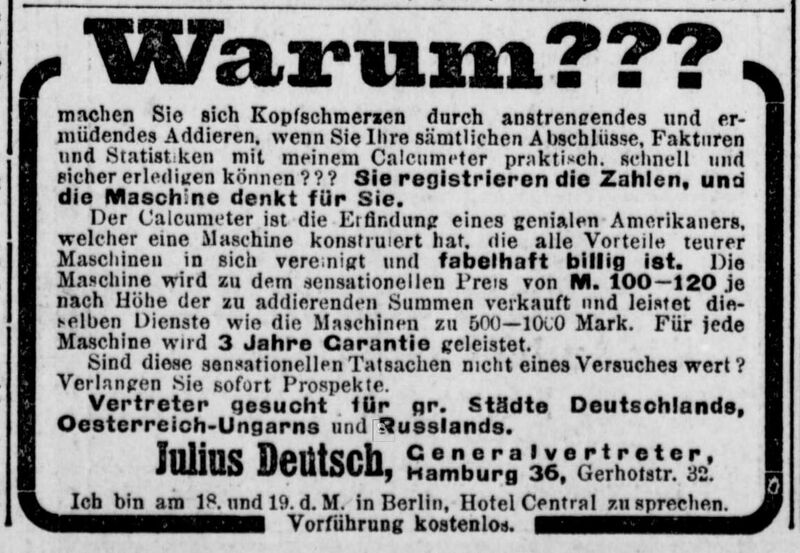 rechnerlexikon.de's page on the Calcumeter. 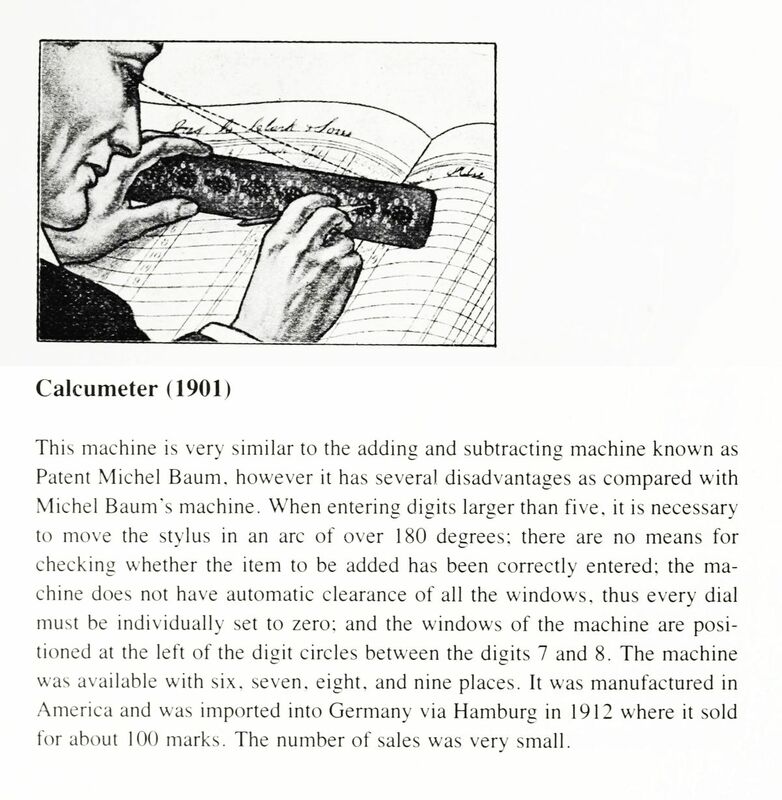 Detlev Bölter's site (German) is a very good page on the Calcumeter. 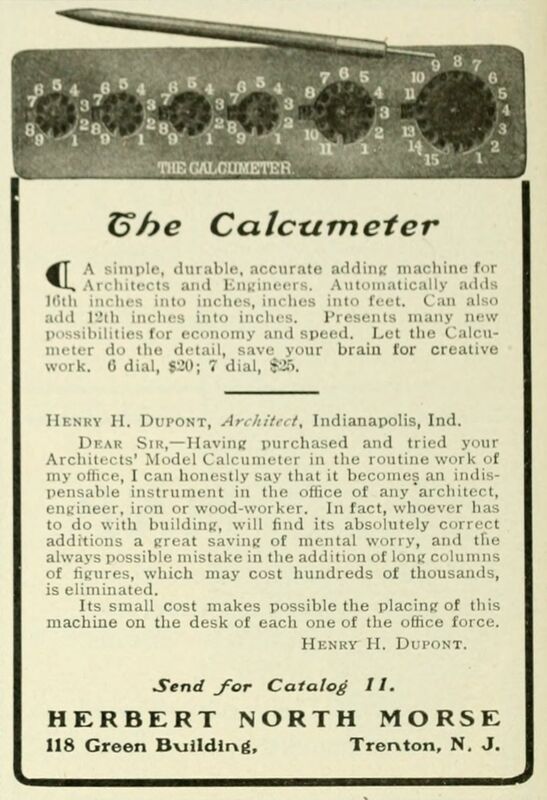 American Stationer has a nice article with a link to scans of the instruction leaflet. History of Computers wrongly claims it has a stored-energy carry mechanism. 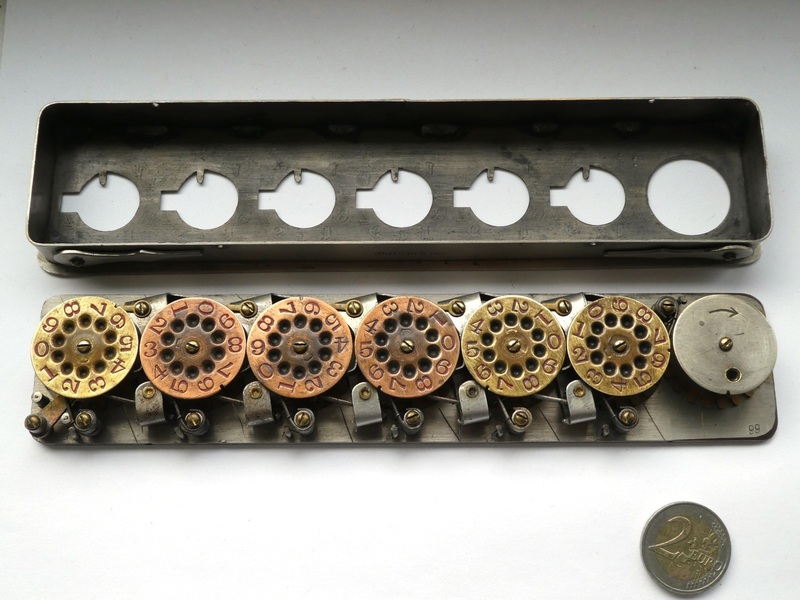 Rechnen ohne Strom (German) shows the Calcumeter amongst other metal adders. Office Collectibles, J.M. 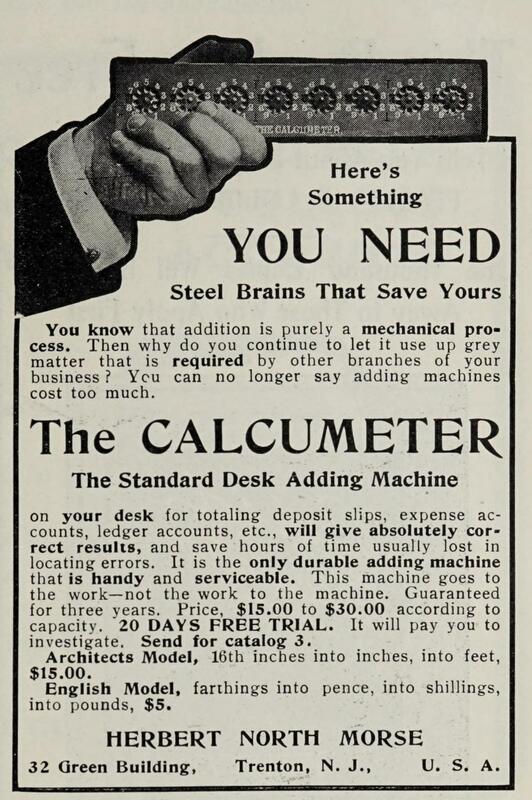 Goldman's collection contains a Calcumeter. The Powerhouse Museum in Sydney has a Calcumeter. 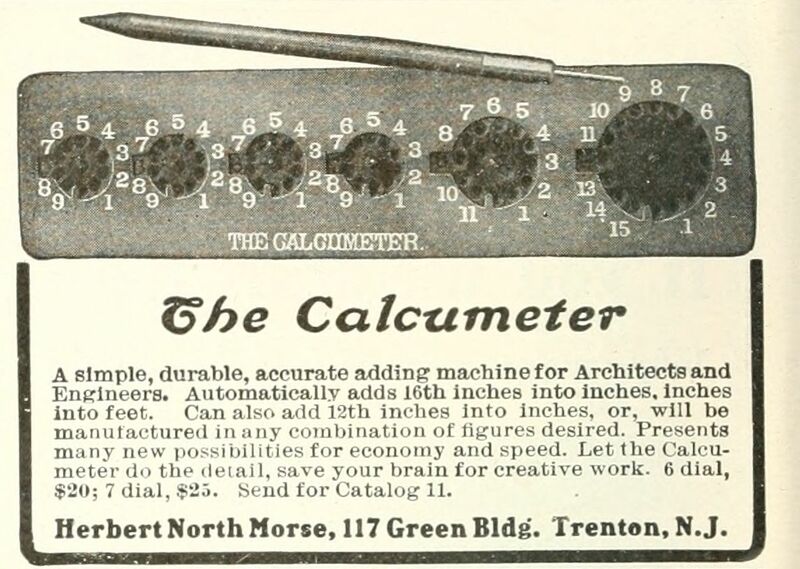 National Museum of American History has an 8-wheel calcumeter as well as an older 5-wheel Calcumeter. © Copyright 2017-2018 Jaap Scherphuis, mechcalc a t jaapsch d o t net.